I love when reader's send me pictures of their finished projects. Recently a reader named Katharine from Raleigh, North Carolina sent me pictures of her beautiful kitchen. It's in need of a good update right? Here are the After photos! Isn't it beautiful? Garnet & Grey General Contractors did her renovation. The fabricator and stone supplier was Design Surfaces. I asked Katharine a few questions about her project, here are her answers. Why did you select Bianco Romano? Were you out looking for this particular color or did you come upon it while looking in the slab yards? "I was looking for something like to keep the room open and airy and to match the furniture we already have, which has a lot of tans in it, so I didn’t want anything too gray. I thought about Calcutta Marble, but didn’t want to deal with the upkeep. I wasn’t looking for this particular color- I know sometimes it can have a lot of purple in it, which I was trying to avoid- but when I came across this slab, I knew it was the right one." What is your favorite part of your kitchen? "Everything! 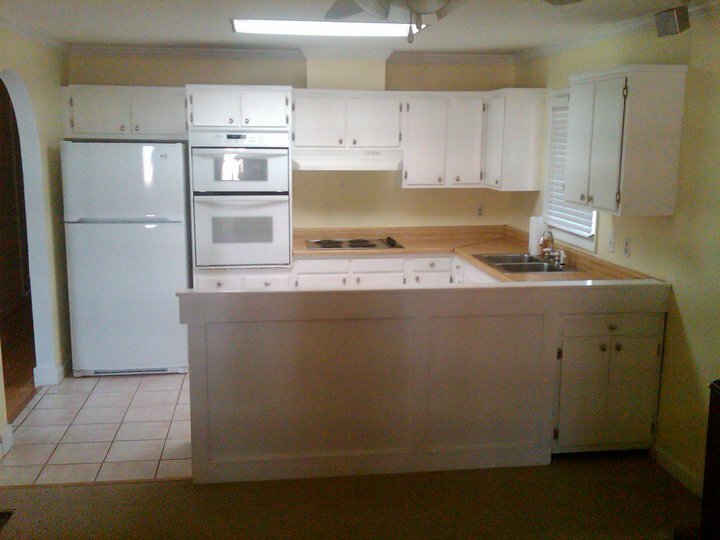 I’m so glad to have new cabinets, countertops, lighting and floors. It’s made me feel completely different about my house- I love coming home to this new space." Any regrets? "That we didn’t do this 5 years ago when we bought the house." 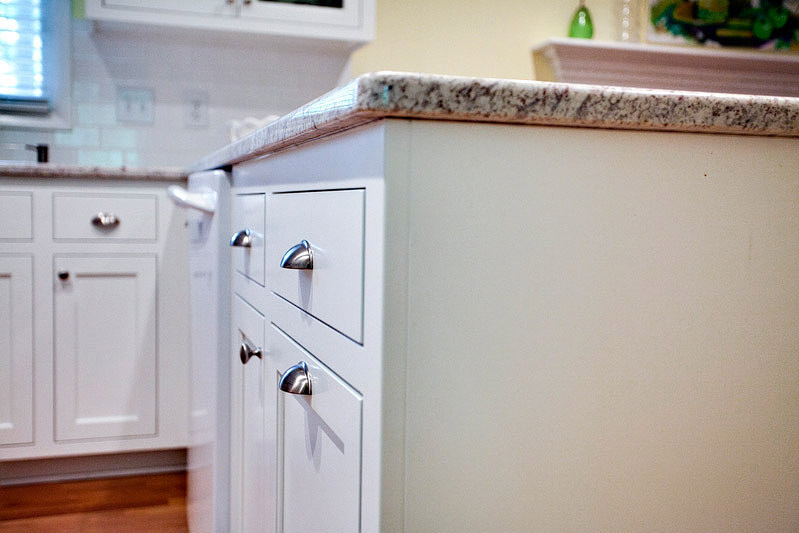 What are you using to clean your countertops? "409 Natural Stone Cleaner." What type of sink did you use? Are you happy with it? 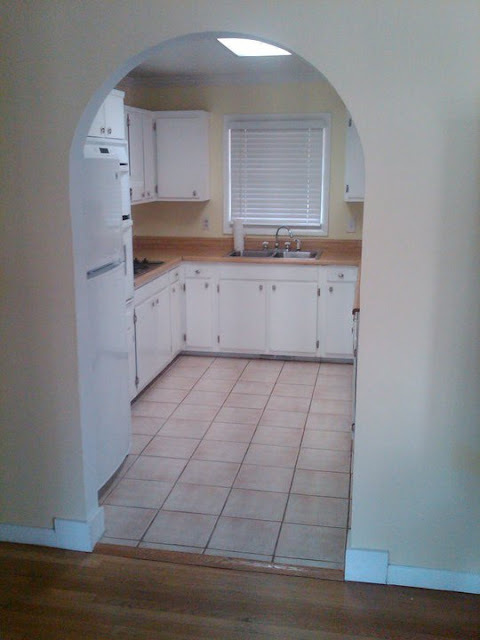 "We chose a sink that has the same size bowl on each side. Originally I wanted a farm sink, but our kitchen really wasn’t wide enough to accommodate it, so the most important thing to me was being able to fit a 9x13 casserole dish flat in the bottom of the sink, which I can do in both sides now. And I like the symmetry of it. The faucet is one of my favorite things because it is so simple and has such clean lines- it’s Kohler Simplice." Photos courtesy of Jed Gammon Photography. Thanks for sharing the pictures Katharine! I love seeing how all of your projects turn out! If you would like to show pictures of your finished project here, send me (Steph) an email. I love Bianco Romano and I'm thinking about using it in my kitchen. It's good to see it installed. Thanks to the reader for sharing! It looks so great. 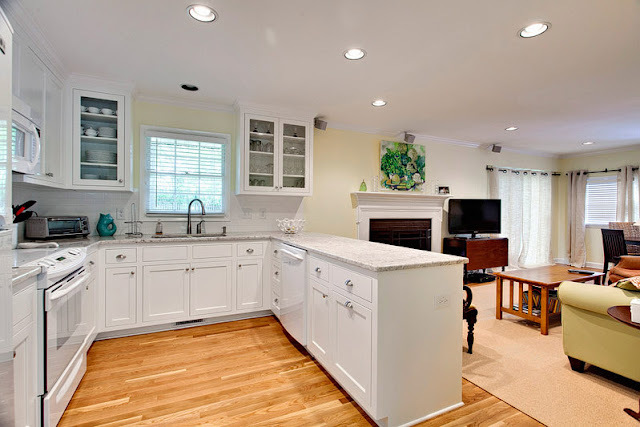 I think the wood floors, granite countertops and new pulls on the cabinets made the biggest difference. 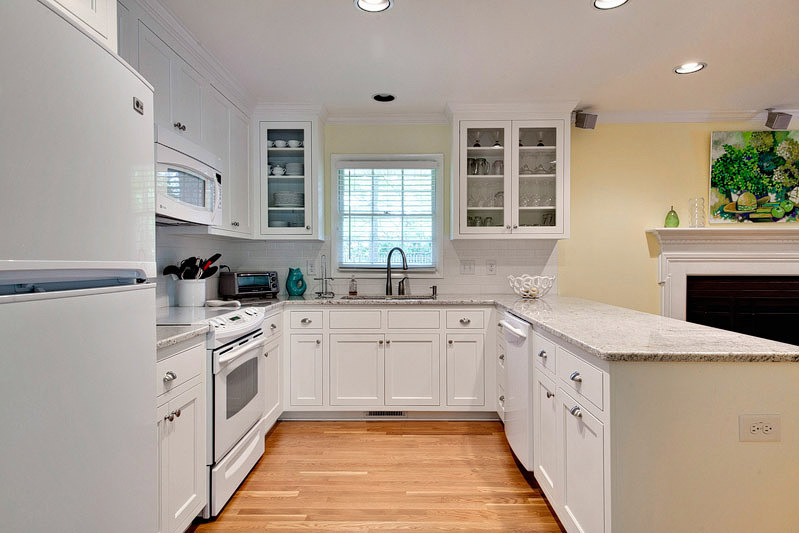 I like the granite and I also like the white shaker cabinets. Who manufactured them? 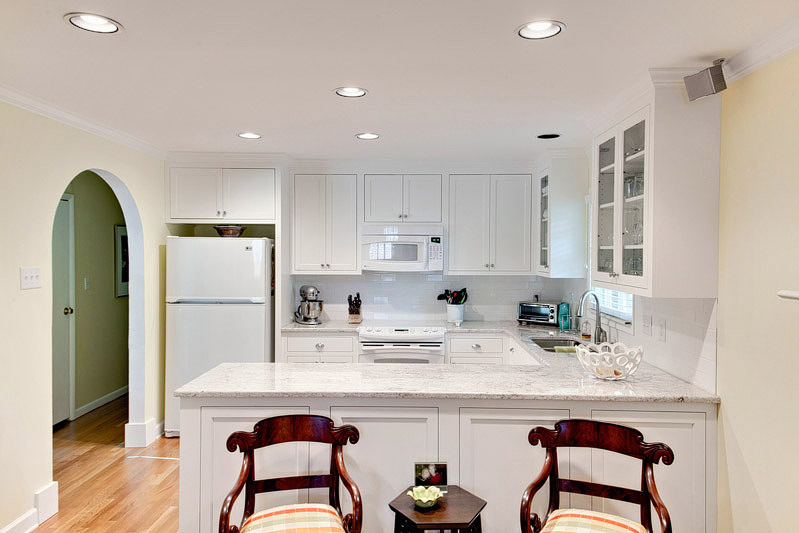 I like the granite very much and I also like the white shaker style cabinets. Who manufactured them? 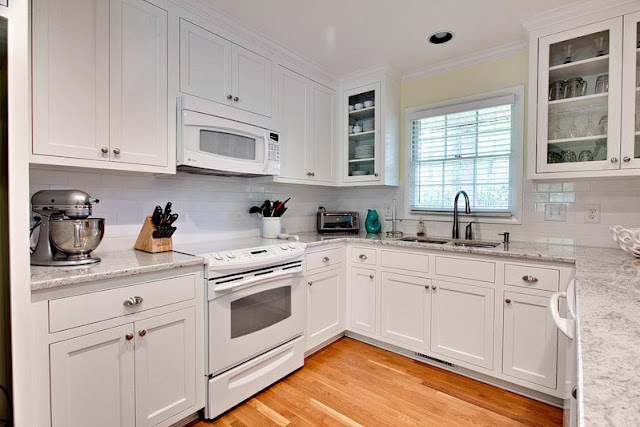 I like the granite and I also like the white shaker style cabinets. Can you tell me who manufactured them? I'm not sure who manufactured the cabinets. Sorry!